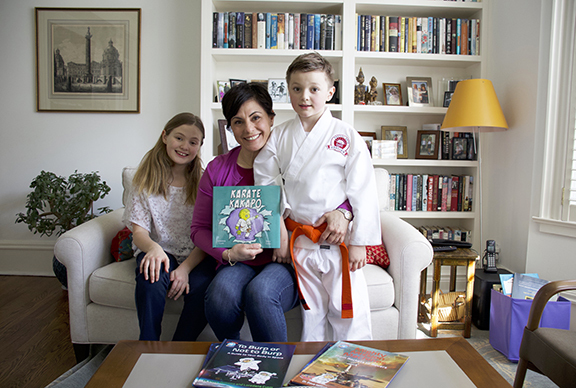 Beach children's author Loredana Cunti with her children Vienna and Frederick and a copy of Karate Kakapo, her latest book. Photo by Remi Stephanie Rozario. The responsibility of raising kids may put a brake on the careers of some women, but for Beach children’s author Loredana Cunti it was an eyeopener to all the wonderful opportunities it provided to steer her into the world of writing. Her first inspiration came from her kids, and now she has published her fifth book – Karate Kakapo. 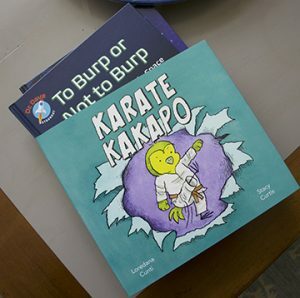 Karate Kakapo is Cunti’s first picture book, and it published this month. The story is an original concept that occurred to her when her daughter Vienna had a hard time kicking the ball in soccer. Cunti’s friend’s daughter had a similar problem in that she couldn’t yell in taekwondo, a martial art. The situation inspired Cunti to come up with the idea for a story about a taekwondo bird who couldn’t fly and needed to get a flying kick in order to master the black belt. “We looked at other flightless birds and Karate Kakapo was born,” she said. Cunti’s initial job was as a children’s television producer, and she travelled around the world looking for books to turn into television shows. She is currently developing a couple of animated television shows with companies in Canada. When she had kids, she wanted to reinvent herself and do something that would tick the boxes in her career while also ensuring she could pick up her kids after school. So, she started working on a television show based on a series of books about space. Cunti approached a Canadian astronaut, Dr. Dave Williams, who is a record-holder for longest time spent space-walking. They have been developing a television show together during the course of which they co-authored their first book in 2016 – To Burp or Not to Burp: A Guide to Your Body in Space which established a series of four junior nonfiction books. Karate Kakapo was the first book she wrote alone. Artist Stacy Curtis did the illustrations. Cunti takes pleasure in writing books for children while also taking care of her own. Conversing with her children gave her mind its own space for a distinctive thinking pattern. “These little people in my brain, you know, it gets to the point where they just won’t stop talking to me, these little friends, animals, whatever they are, and I have to write them down,” she said. Alongside her passion for writing, Cunti also loves to eat and she believes that growing up Italian played a major role in her devotion towards learning new techniques. When she lived in Paris, she spent a year at the Le Cordon Bleu – a French hospitality education institution and became a qualified pastry chef. Her expertise in cooking inspired her to write a cookbook intended for kids. Her children, Vienna, 10, and Frederick, 8, are little master chefs of their own as they have been at the kitchen counters from a very young age. While having a healthy balance between her family life and career, Cunti said that she comes up with “some crazy dumb idea” every day hoping something might come out of it. “I like to say if I get kind of taken by aliens or something, my sort of half-written ideas are in my drawer. In case anybody’s looking for them,” she said.